For five years, the cornerstone of my Cycle for the Cause fundraising has been a hockey scrimmage at Sky Rink. This past Sunday morning this year’s scrimmage took place and the fundraising hit a record total of $2,570.01, which is about $500 more than the 2013 scrimmage. Over the five years, the Sky Rink hockey community has donated just over $9,100 to benefit the HIV/AIDS services at the LGBT Center in NYC. Thanks to everyone who donated and skated and to those who donated by couldn’t make the skate. The ongoing support is so appreciated. 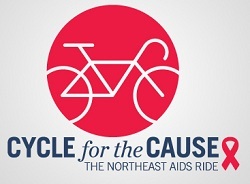 My fundraising for the September 19-21 ride continues all summer. I’m currently at 70% of my $4,500 goal (I’m trying to exceed, if only by a little bit, the $4,000 I raised last year). Please donate to this important cause if you can. Every little bit helps. You can donate online here. One of the things I like about this skate is that some friends I don’t get to play with much come play. Roman and Igor are a few divisions above my skill level and with no more Ronnie’s Ice, we only play together one-a-year at this scrimmage. 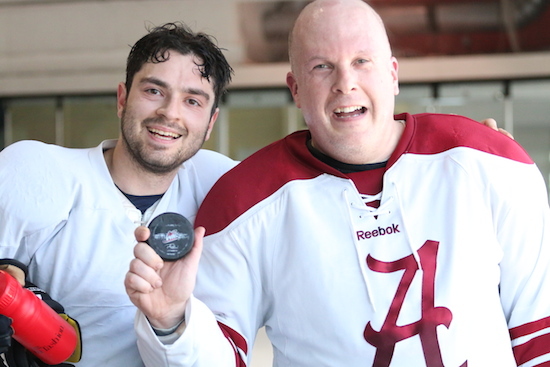 This year we three played D, so I shared the ice with both of them. Roman’s ongoing project is to set me up to score in these scrimmages.